The five-star DoubleTree by Hilton Hotel Wrocław is the first five-star DoubleTree hotel in Poland. It is located in the futuristic OVO Wrocław complex in the city centre. Materials used for its creation and the unusual shape make the hotel a unique place in Wrocław. In the hotel there are seven conference rooms, a 317 sq. meter ballroom and, additionally, a fitness centre with a swimming pool and saunas. Moreover, the OVO complex offers a recreational club, spa centre and a casino. Due to the localization in the city centre, DoubleTree is perfectly connected with the rest of the city. The Granary Hotel Wrocław is a five-star hotel in the historical centre of Wrocław located in a 16th century building which formerly was a garner. The boutique hotel excells in the original interior design. It has stylish rooms and apartments – each of them is different in terms of size and configuration because of the tailor-made furniture and handcrafted beds. Moreover, the hotel has five conference rooms, a spa centre, gym and spa bath. Guests may also enjoy the garden which is especially charming after dark, or eat a meal in the restaurant “Mennicza Fusion” which specialty is the seasonal international cuisine. 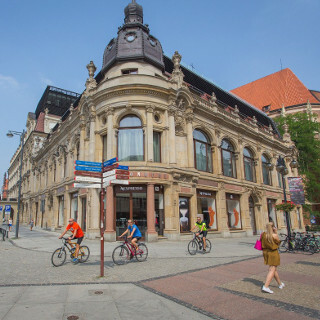 The five-star Monopol Hotel, the oldest hotel in Wrocław is located on one of the main streets of the city. At the turn of centuries it fulfilled the standards of the most luxurious European hotels. It hosted many famous persons, i.a. Pablo Picasso, Irene Joliot-Curie and Mikhail Sholokhov, the winner of the Nobel Prize in Literature. In the hotel restaurant, it was possible to meet Wrocław's scientists and artists. The interiors of the hotel were, in turn, the background for some famous Polish films. Currently, the hotel has five conference rooms. Additionally, in the hotel there are an indoor swimming pool, a sauna, steam room with aromatherapy, salt-iodine cave and gym. Moreover, there are two restaurants. One of them – the Acquario Restaurant – is on the sixth floor, has glazed interiors and a spacious terrace. 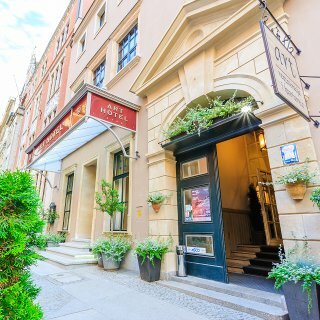 The Art Hotel is located in the Wrocław Market Square in the interiors of one of the oldest houses in Wrocław. The hotel supports the Wrocław artistic environment and is engaged in the cultural initiatives. The interior of the hotel was designed and handcrafted by the local artists and craftsmen. Moreover, in the hotel there is a library with books with the autographs of writers who were guests of the hotel. The hotel has four spacious conference rooms. There is also a fitness room and the Art Restaurant and Café which fascinates with its subtle interior and the regional Polish cuisine. The PURO Hotel Wrocław is located in the vicinity of the city centre, in the Four Denominations District. It belongs to the chained- brand hotels with building automation. Each room has a touch panel which enables a person to regulate the room function. Due to this, each person may easily fit the interior to his or her own mood. Guests may also go to the lobby with computers. In the hotel there are three conference rooms. The hotel has at its disposal a cosy bar and a patio with charming garden. The hotel is pet-friendly. The three- star ibis Styles Hotel is located opposite to the Main Railway Station. The glass block of the hotel in connection with the fabulous interiors create a magical, inimitable atmosphere for people who prefer the surprising solutions.In the hotel there are rooms with soundproof panoramic windows, so the guests may relax in silence. The décor of rooms refers to the magical atmosphere known from the Alice's Adventures in Wonderland. In the Silver Tower Conference Center there are eight conference rooms. Guests may eat a meal in a bar or a restaurant “Czary Mary” which specialty is the international cuisine. It is also possible to taste there the wines from all over the world. The Platinum Palace Hotel is located in the silent part of Wrocław close to the lovely Południowy Park. The modern hotel in the historical residence of Schoeller family is a perfect place for people longing for relax. In the hotel there are rooms and apartments offering the view of the city panorama or the Południowy Park which is a natural continuation of the Schoeller garden. Guests may also take advantage of a steam room, sauna, jacuzzi and fitness centre. In addition, there is a restaurant which provides the dishes made of products from local ecological suppliers. Guests may also taste the alcohol in a bar Insomnia. The Platinum Palace has at its disposal three stylish conference rooms. The AC by Marriott Hotel will be located in the historic tenement on Plac Wolności and will be the first hotel of this brand in Poland. The luxurious interiors are to be opened at the turn of 2016 and 2017. The building of the hotel used to be the place of residence of the Reichsbank, the central bank of Germany. Later, the building belonged to the Bank Zachodni WBK. The object will probably have about 100 rooms. Apart from rooms, there will be a fitness club with the swimming pool and a restaurant, two saunas, jacuzzi and gym. On the ground floor there will be a hall with a bar, restaurant and a place to rest. Moreover, the object will have the opportunity to organize a business meeting in three conference rooms. The Piast Hotel is a hotel offering the view on the Main Railway Station. Before the war, it was the most elegant hotel in the city. Together with the Hotel du Nord (currently Grand Hotel which is being renovated), it created a symbolic “gate to the city” because of the characteristic domes. Currently, renovated Piast Hotel is a two-star hotel which can gather up to 90 people. In the hotel there is a conference room and a self-service restaurant “Bistro Station” which offers diversified dishes prepared from the best ingredients. Novotel & ibis Wrocław Centrum Combo is located in the former place of the Orbis Hotel. Four floors belong to the ibis Hotel and six belong to the Novotel which is planned to be opened on 1 August 2016. The Centrum Combo is close to the Main Railway Station and the SkyTower, the highest skyscraper in Poland. Novotel & ibis Wrocław Centrum Combo is the next hotel proposal of the brand Accor in Wrocław. It offers a recreational centre with a swimming pool, sauna, mini fitness room and massage salon. Guests may eat a meal in a restaurant with the Polish and international cuisine or in a bar “Aperitif”. The hotel offers also conference facilities: 13 meeting rooms.